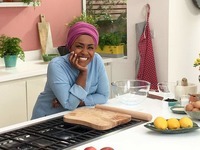 Nadiya Hussain is a British baker, columnist, author and television presenter. The Secret Lives of the Amir Sisters is her debut novel. Hussain was born to a British Bangladeshi family in Luton, where she grew up. She developed her interest in cooking while at school and largely self-educated herself in cooking by reading recipe books and watching instructional videos on YouTube. She married and moved to Leeds, where she began studying for an Open University degree. In 2015 she appeared on the BBC's The Great British Bake Off and won the contest. She was subsequently invited to produce a cake for the 90th birthday celebrations of Queen Elizabeth II and to present her own BBC documentary, The Chronicles of Nadiya. Hussain is a columnist for Th Nadiya Hussain is a British baker, columnist, author and television presenter. The Secret Lives of the Amir Sisters is her debut novel. Is this you? Let us know. If not, help out and invite Nadiya to Goodreads.